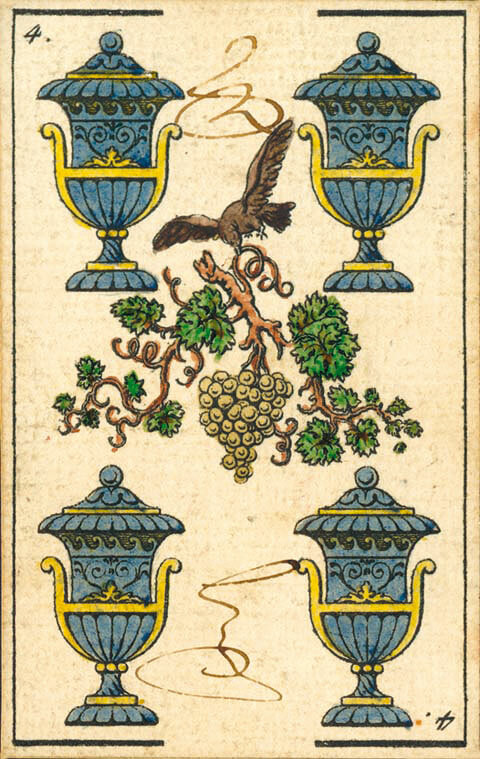 The “Baraja Mitológica” was first published in Madrid in c.1815 by Josef Monjardín from engravings by José Martínez de Castro, whose monogram appears on the ace of swords. The original drawings were probably by José de Rojas. In those days engravers might arrange for a local printer to produce their work and then sell the finished products themselves; alternatively they might sell the engravings to an established publisher. Consequently many editions appeared either anonymously, self-published or by different publishers. The printer’s details may or may not have appeared on the wrapper of a particular edition. As can be seen in the images below, José Martínez de Castro’s engavings exhibit superb draughtmanship, clean and precise lines without any unnecessary ornamentation or fussiness. 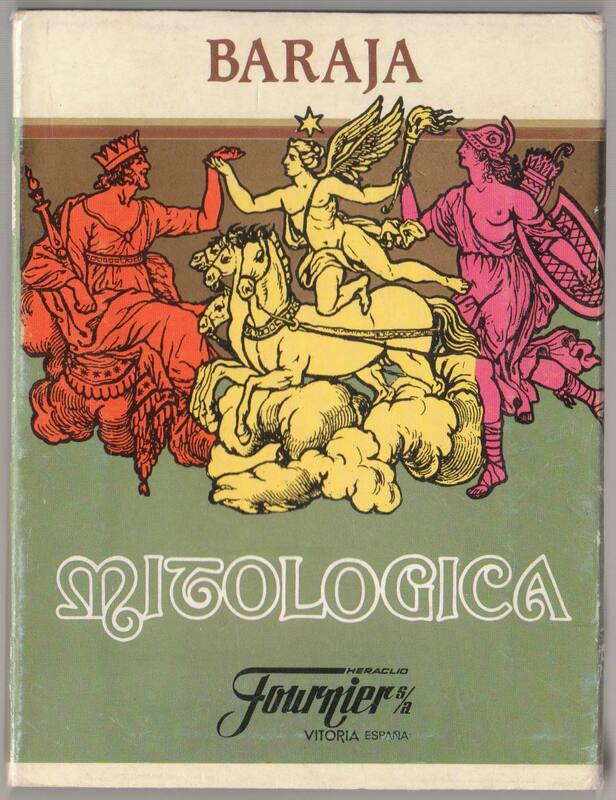 José de Rojas would have availed himself of the countless dictionaries of mythology and emblematic material available in 19th century Spain. Above: cards from a hand-coloured edition of “Baraja Mitológica” by an unknown publisher from copper plate engravings by José Martínez de Castro, Madrid, 1817. 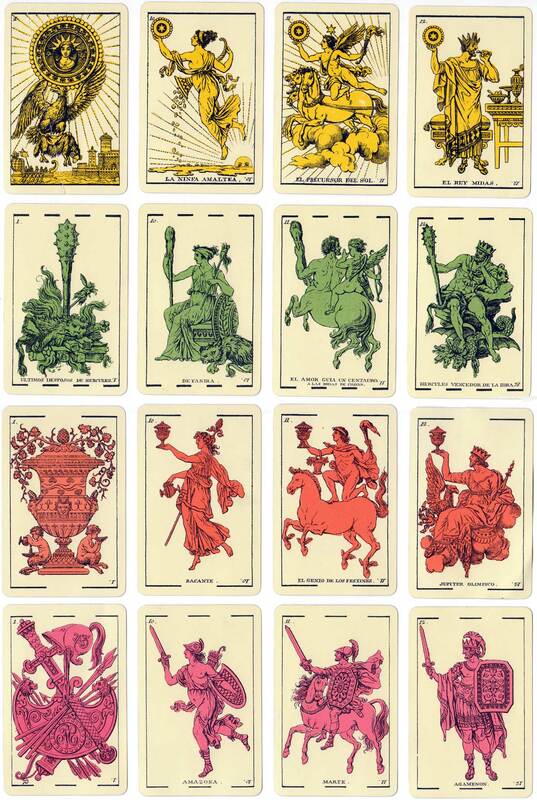 The court cards depict classical heroes and deities. Images courtesy Alberto Pérez González. 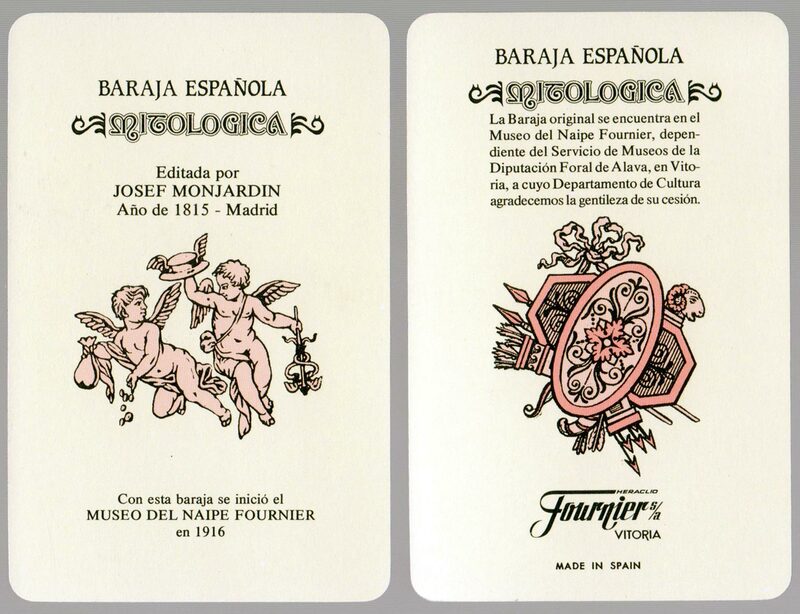 Above: cards from facsimile edition published by Heraclio Fournier in 1989, based on an original copy published in 1815 by Josef Monjardín. Denning, Trevor: Catalogue of Trevor Denning’s Collection of Spanish Playing Cards, Birmingham, privately published. Thanks to Alberto Pérez and Samten de Wet for additional research and to Rex Pitts for scans of the facsimile edition by Heraclio Fournier.